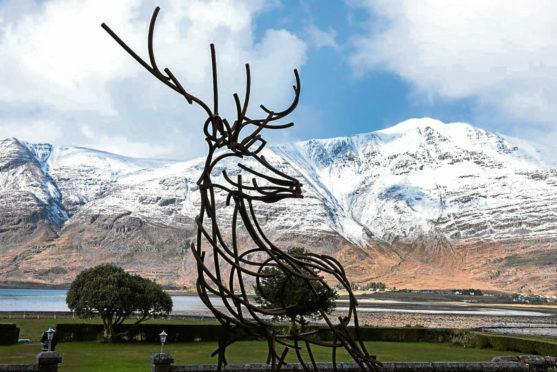 Until you’ve picked up your car at Inverness Airport and set out along the North Coast 500, it’s hard to grasp exactly how beautiful Scotland is – and also, just how hungry all that open sky and chilly air will make you. A coastal road that loops up, round and down the frilly edges of the kite-shaped land mass of the Highlands, the NC500 may wind beside beaches, cliffs, mountains, meadows, prairies and rivers, but experiencing the views wasn’t our only aim on a snowy weekend in March. 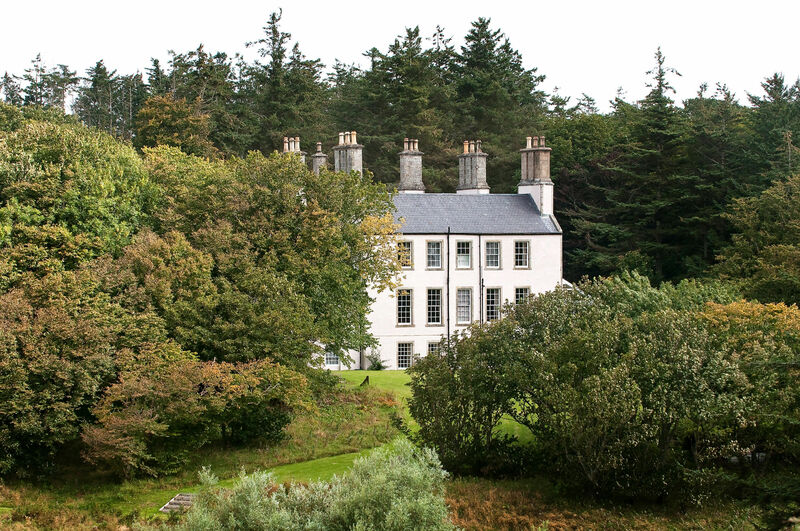 Built in 1810, Forss House Hotel is set into springy earth, dotted with marshmallowy-white snowdrops at this time of year. A 30-minute drive from Thurso on the north coast, and a little longer from John O’Groats, Britain’s most north-eastern tip, there’s buttery shortbread in the room, and breakfast could arguably keep you going the entire 500 highland miles. The ‘full Scottish’ comes with crumbly, moreish black pudding that hails from the highland village of Aultbea; the bacon is cured and smoked in Caithness; while the eggs – scrambled and silken with cream – are laid at Lochquoy Farm, where the chickens have their own view of the Orkney Islands. You can’t get more local. 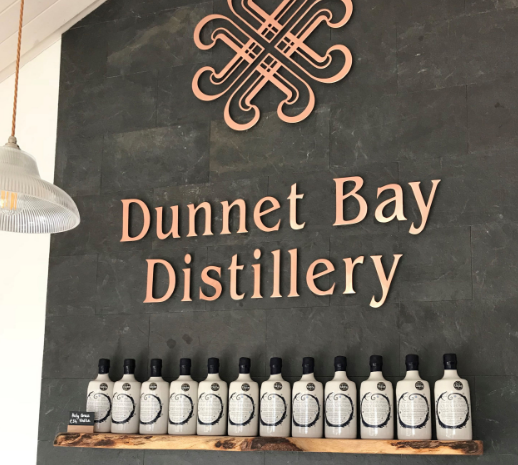 Between John O’Groats and Thurso is Dunnet Bay Distillers, a squat, grey one-story building that conceals a distiller called ‘Elizabeth’ and an inventive lab, where husband-and-wife team, Martin and Claire Murray, concoct their Rock Rose gin. Process engineer Martin used to brew his own stout but, as it increasingly went undrunk, he switched to gin, and in 2014 started producing Rock Rose. Strikingly bottled in ceramic (our host Anne at Forss House tells us the bottles remind her “of the old ceramic hot water bottles”), their curling, colourful labels are designed by Claire, and the gin inside is flavoured with locally-foraged botanicals, and anything they grow themselves. Blaeberries (also known as bilberries), nettles, gorse, lemon verbena, spruce, and pineapple sage (“It looks and feels like sage, but smells exactly like pineapple,” says Martin, thrusting a handful of the dried stuff under my nose) all get a look in. “It’s a real balance getting the flavours right,” he adds, opening up a mini geodome in the car park, which houses olive trees and bay, while outside, there’s a small orchard and raised beds, crammed with rose root, water mint, thyme and borage. Back on the road, snacks are necessary – namely Tunnock’s Tea Cakes and that shortbread filched from the Forss House Hotel tea caddy. There are many places to pull up and spot stags moseying along, and to find yourself metres from the ocean, seals sunbathing on the rocks below. But before summer kicks in, the NC500 is big on views and short on cafe pit stops. When we do arrive at The Torridon Hotel on the western coast, having driven through snow, sleet, yolk-yellow evening sunshine and slate-like sheets of rain, we ensconce ourselves in the hotel’s whisky and gin bar. There might be more than 365 whiskies on the menu – and it’s a wee dram that’s offered with porridge at breakfast – but everyone’s drinking the hotel’s own gin, Arcturus. It’s made using locally-foraged Scots lovage, blaeberries and kelp, which are packaged up and sent to Dunnet Bay Distillery, where Martin distils and bottles it. We intersperse a pre-dinner game of chess with crisp sips from huge balloon glasses, orange peel bobbing over ice. Dinner itself is inherently mysterious. We opt for the winter tasting menu (£80 per person) and instead of being told what dishes to expect, are given a list of ingredients that will appear, some foraged, some grown in the hotel kitchen garden, others courtesy of local hunters and fishermen. A perfectly plump langoustine rests on a glossy cauliflower puree; barbecued leeks rub shoulders with tart slices of Granny Smith apple and muscular cured trout; slivers of hand-cut venison tartare are bundled inside leaves of burnished chicory; warm homemade bread is slathered with Marmite-infused butter. Perhaps the best of the lot is a garden salad, drizzled in a sweet, sharp dressing and embedded with crunchy nuggets of deep-fried veal sweetbreads. They should tell you to come for the views, and stick around for the food. 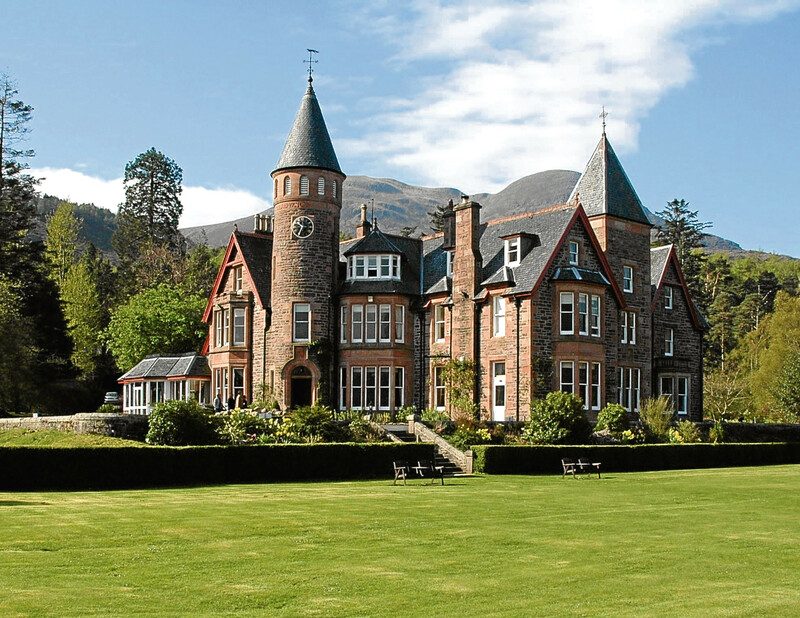 Ella Walker was a guest of The Torridon Hotel (from £132.50pp per night), thetorridon.com; 01445 791 242. A stay at Forss House Hotel starts from £87.50pp per night, forsshousehotel.co.uk; 01847 861 201. Car hire was supplied by Jack’s Self Drive, jacksselfdrive.co.uk; 01463 236 572.